Leaders of organized labor in Ondo State have begun receiving short text messages (SMS) posing ‘threats’ to their lives a few days after suspending the thirty-day strike embarked upon by government workers in the State, SaharaReporters has learned. 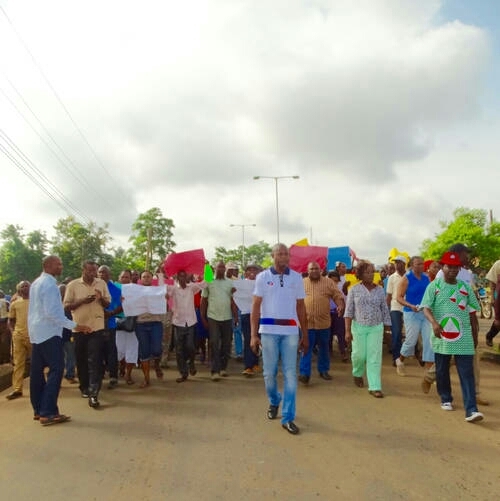 Impeccable sources confirmed this latest information to our correspondent in Akure on Sunday, saying that the ‘threat messages’ had been rolling in some days after labor leaders announced the suspension of the one-month strike last Thursday. One of these sources that spoke with SaharaReporters and pleaded anonymity disclosed that some who sent the messages also threatened to attack and destroy personal properties that belonged to the organized labor leaders in the State. The source further disclosed that the content of the messages appeared to be from aggrieved workers who felt that the leaders of organized labor had compromised with the government in calling off the thirty-day old strike which paralyzed economic activities. “No matter the content of the messages, our concern is the threat posed to the lives and properties of these labor leaders who acted both in the rain and sun. “And it was to ensure that the State government paid the accumulated salaries of these civil servants who had been at home for a good thirty days. “The case at hand is like a servant threatening to kill his leader, and this is bad especially in this society in which we live. “I don’t know why someone whose rights you are fighting for would be threatening to deal decisively with you,” an angry source told our correspondent on Sunday evening. Another source in the workforce of the State who spoke with SaharaReporters wanted an investigation into the content of the messages but also criticized the labor leaders for accepting the payment of just one month's salary for the mainstream civil servants. This same source who later spoke in an exclusive phone chat with our correspondent asserted that the workers would not have gone on strike if they had known the labor leaders would negotiate for one month's worth of salary payments with the State government. “I felt that they [labor leaders] didn’t win any battle as being claimed by them because they only reached an agreement with the government on paying one month out of the five months' accumulated salaries owed to the workers. “Don’t forget, we started this strike around June 1 and had a marathon protest calling for the full payment of our salaries, and in the long run of the industrial dispute, the strike entered its sixth month [of unpaid salaries], but unfortunately only one month was paid," one source told our correspondent. The source further challenged the labor leaders to thoroughly explain to the civil servants the rationale for sharing the payment of the reduced salaries. “So, let the labor leaders tell us the essence of the strike when the mainstream civil servants in the State, including primary school teachers, are to receive one month's salaries, while staff of the Ondo State Oil Producing Area Development Commission (OSOPADEC) would get three months' salaries for February, March and April. “My brother, there is lot of cheating in the payment of these salaries which the State government would embark on as from Monday because it’s a way of causing division among the workers,” he said. However, some teachers have been kicking against the unfavorable payment and asked the State government to consider them more than other workers in the State due to the stressful nature of their jobs. SaharaReporters gathered that many of these labor leaders are now living in ‘fear’ just as civil servants in the State have been directed to return to their duty posts after marathon negotiations with the State government over their salaries. One of the labor leaders who confirmed the receipt of the threat messages to a SaharaReporters correspondent stated that some of the messages were life-threatening and came from influential civil servants in the State. “Some of them, mostly influential civil servants, have been sending us threat messages while others who could not hide their ugly faces have been deliberately challenging us to ask why we negotiated one month out of the five months' owed to them. “Sadly enough, one of them confronted me in the church today [Sunday] and asked how much we received for sitting and food allowance for the four days' marathon negotiations that triggered the one-month salary payment for mainstream civil servants,” the source disclosed to our correspondent. This labor leader further disclosed that the issue had already been reported to security agencies in the State. A SaharaReporters correspondent reported that many of the civil servants are now prepared to resume their normal government work and activities on Monday after an assurance from the State government to offset their salaries. The State government and the organized labor leaders reached a striking-balance last Thursday to reduce the salaries of the civil servants from the demand of five months to one month in exchange for workers’ resumption of work.